Air-Weigh has teamed with Chameleon to promote its on-board scales. MONTREAL, Que. — Air-Weigh has established a partnership Chameleon Transportation Systems in an effort to better serve the needs of the trucking industry in the Qubec area. Chameleon is the manufacturer of the Freeload-R Rolling Tarp System, retractable covers, and collapsible storage containers, and has been an authorized dealer for Air-Weigh On-Board Scales since 2006. To help publicize the availability of Air-Weigh Scales in Qubec, Chameleon is offering a free Air-Weigh scale to all customers purchasing a rolling tarp system until July 31. “We believe that our trailer customers will best realize the benefit of the Air-Weigh systems through experiencing it,” said Tania Neumann, Chameleon’s national sales manager. 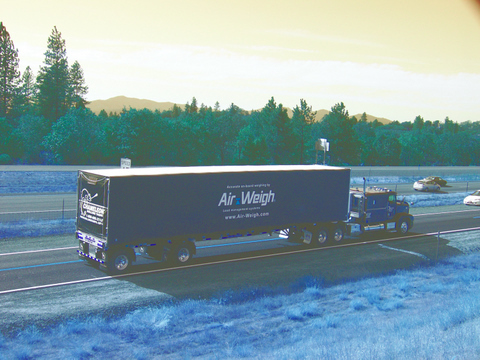 With rising fuel costs and increased competition in the trucking industry, Air-Weigh officials have seen a rise in the popularity of on-board scales. According to the manufacturer on-board scales allow drivers to avoid all of the costs and delays caused by weighing at an in-ground scale, while eliminating overweight fines. The offer includes installation at Chameleon’s headquarter service centre in Dorval, Que.